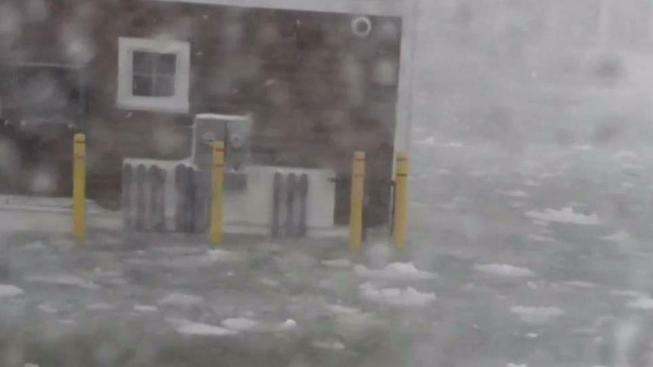 Thursday afternoon brought snow, wind and flooding to coastal communities like Scituate, Massachusetts. While the waves were crashing Thursday, the harbormaster of Scituate, Massachusetts, was rushing to secure his boat when he was knocked into the water. The epic storm of snow and wind had already started flooding the harbor and nearby parking lots. "Whether I could get him or not, I wasn't sure he was going to last," said Stephen Hill, the general manager of the nearby Mill Wharf Restaurant, who watched as a wave knocked Stephen Mone into the frigid sea. "He was going to disappear." Out of the corner of his eye, Mone saw Hill running toward him. "I saw him and I just said, 'I don't have much more time, I can't hold on anymore,' and he grabbed me," Mone said. Mone said he couldn't have done it alone, but working together, the two were able to get back on the dock. They later met with Gov. Charlie Baker. "It was nice to see Steve and get a big hug from him," Hill said. "He saved my life,' Mone said. "I'm grateful, I can't thank him enough."